Originally published by Kai Waehner at https://www.confluent.io/blog/machine-learning-with-python-jupyter-ksql-tensorflow . Machine Learning With Python, Jupyter, KSQL, and TensorFlow. This post focuses on how the Kafka ecosystem can help solve the impedance mismatch between data scientists, data engineers and production engineers. Building a scalable, reliable, and performant machine learning (ML) infrastructure is not easy. It takes much more effort than just building an analytic model with Python and your favorite machine learning framework. When Michelangelo started, the most urgent and highest impact use cases were some very high scale problems, which led us to build around Apache Spark (for large-scale data processing and model training) and Java (for low latency, high throughput online serving). This structure worked well for production training and deployment of many models but left a lot to be desired in terms of overhead, flexibility, and ease of use, especially during early prototyping and experimentation [where Notebooks and Python shine]. So why did Uber (and many other tech companies) build its own platform and framework-independent machine learning infrastructure? The posts How to Build and Deploy Scalable Machine Learning in Production with Apache Kafka and Using Apache Kafka to Drive Cutting-Edge Machine Learning describe the benefits of leveraging the Apache Kafka ® ecosystem as a central, scalable, and mission-critical nervous system. It allows real-time data ingestion, processing, model deployment, and monitoring in a reliable and scalable way. This post focuses on how the Kafka ecosystem can help solve the impedance mismatch between data scientists, data engineers, and production engineers. By leveraging it to build your own scalable machine learning infrastructure and also make your data scientists happy, you can solve the same problems for which Uber built its own ML platform, Michelangelo. Based on what I’ve seen in the field, an impedance mismatch between data scientists, data engineers, and production engineers is the main reason why companies struggle to bring analytic models into production to add business value. There is an impedance mismatch between model development using Python, its tool stack and a scalable, reliable data platform with low latency, high throughput, zero data loss and 24/7 availability requirements needed for data ingestion, preprocessing, model deployment and monitoring at scale. Python, in practice, is not the most well-known technology for these requirements. However, it is a great client for a data platform like Apache Kafka. Thus, you need to train and deploy the model built to a scalable production environment in order to reliably make use of it. This can either be built natively around the Kafka ecosystem, or you could use Kafka just for ingestion into another storage and processing cluster such as HDFS or AWS S3 with Spark. There are many tradeoffs between Kafka, Spark, and several other scalable infrastructures, but that discussion is out of scope for this post. For now, we’ll focus on Kafka. Official standards like Open Neural Network Exchange (ONNX), Portable Format for Analytics (PFA) or Predictive Model Markup Language (PMML): A data scientist builds a model with Python. The Java developer imports it in Java for production deployment. This approach supports different frameworks, products, and cloud services. You do not have to rely on the same framework or product for training and model deployment. Consider ONNX, a relatively new standard for deep learning — it already supports TensorFlow, PyTorch, and MXNet. These standards have pros and cons. Some people like and use them; many don’t. Developer-focused frameworks like Deeplearning4j: These frameworks are built for software engineers to build the whole machine learning lifecycle on the Java platform, not just model deployment and monitoring, but also preprocessing and training. You can still import other models if you want (e.g., Deeplearning4j lets you import Keras models). This option is great if you: a) have data scientists who can write Java or b) have software engineers who understand machine learning concepts enough to build analytic models. AutoML for building analytic models with limited machine learning experience: This way, domain experts can build and deploy analytic models with a button click. The AutoML engine provides an interface for others to use the model for predictions. Embedding model binaries into applications: The output of model training is an analytic model. For instance, you can write Python code to train and generate a TensorFlow model. Depending on the framework, the output can be text files, Java source code, or binary files. For example, TensorFlow generates a model artifact with Protobuf, JSON, and other files. No matter what format the output of your machine learning framework is, it can be embedded into applications to use for predictions via the framework’s API (e.g., you can load a TensorFlow model from a Java application through TensorFlow’s Java API). Managed model server in the public cloud like Google Cloud Machine Learning Engine: The cloud provider takes over the burden of availability and reliability. The data scientist “just” deploys its trained model, and production engineers can access it. The key tradeoff is that this requires RPC communication to perform model inference. So how can the Kafka ecosystem help here? In many cases, it is best to provide experts with the tools they like and know well. The challenge is to combine the different toolsets and still build an integrated system, as well as a continuous, scalable, machine learning workflow. Therefore, Kafka is not competitive but complementary to the discussed alternatives when it comes to solving the impedance mismatch between the data scientist and developer. The data engineer builds a scalable integration pipeline using Kafka as infrastructure and Python for integration and preprocessing statements. The data scientist can build their model with Python or any other preferred tool. The production engineer gets the analytic models (either manually or through any automated, continuous integration setup) from the data scientist and embeds them into their Kafka application to deploy it in production. Or, the team works together and builds everything with Java and a framework like Deeplearning4j. Monitoring the complete environment in real time and at scale is also a common task for Kafka. A huge benefit is that you only build a highly reliable and scalable pipeline once but use it for both parts of a machine learning infrastructure. And you can use it in any environment: in the cloud, in on-prem datacenters, or at the edges where IoT devices are. Say you wanted to build one integration pipeline from MQTT to Kafka with KSQL for data preprocessing and use Kafka Connect for data ingestion into HDFS, AWS S3, or Google Cloud Storage, where you do the model training. The same integration pipeline, or at least parts of it, can be reused for model inference. New MQTT input data can directly be used in real time to make predictions. We just explained various alternatives to solving the impedance mismatch between data scientists and software engineers in Kafka environments. Now, let’s discuss one specific option in the next section, which is probably the most convenient for data scientists: leveraging Kafka from a Jupyter Notebook with KSQL statements and combining it with TensorFlow and Keras to train a neural network. Data scientists use tools like Jupyter Notebooks to analyze, transform, enrich, filter, and process data. The preprocessed data is then used to train analytic models with machine learning/deep learning frameworks like TensorFlow. However, some data scientists do not even know “bread-and-butter” concepts of software engineers, such as version control systems like GitHub or continuous integration tools like Jenkins. This raises the question of how to combine the Python experience of data scientists with the benefits of Apache Kafka as a battle-tested, highly scalable data processing and streaming platform. Kafka offers integration options that can be used with Python, like Confluent’s Python Client for Apache Kafka or Confluent REST Proxy for HTTP integration. But this is not really a convenient way for data scientists who are used to quickly and interactively analyzing and preprocessing data before model training and evaluation. Rapid prototyping is typically used here. KSQL enables data scientists to take a look at Kafka event streams and implement continuous stream processing from their well-known and loved Python environments like Jupyter by writing simple SQL-like statements for interactive analysis and data preprocessing. The result of such a KSQL query is a Python generator object, which you can easily process with other Python libraries. This feels much more Python native and is analogous to NumPy, pandas, scikit-learn and other widespread Python libraries. Similarly to rapid prototyping with these libraries, you can do interactive queries and data preprocessing with ksql-python. Check out the KSQL quick start and KSQL recipes to understand how to write a KSQL query to easily filter, transform, enrich, or aggregate data. While KSQL is running continuous queries, you can also use it for interactive analysis and use the LIMIT keyword like in ANSI SQL if you just want to get a specific number of rows. So what’s the big deal? You understand that KSQL can feel Python-native with the ksql-python library, but why use KSQL instead of or in addition to your well-known and favorite Python libraries for analyzing and processing data? The key difference is that these KSQL queries can also be deployed in production afterwards. KSQL offers you all the features from Kafka under the hood like high scalability, reliability, and failover handling. The same KSQL statement that you use in your Jupyter Notebook for interactive analysis and preprocessing can scale to millions of messages per second. Fault tolerant. With zero data loss and exactly once semantics. This is very important and valuable for bringing together the Python-loving data scientist with the highly scalable and reliable production infrastructure. Just to be clear: KSQL + Python is not the all-rounder for every data engineering task, and it does not replace the existing Python toolset. But it is a great option in the toolbox of data scientists and data engineers, and it adds new possibilities like getting real-time updates of incoming information as the source data changes or updating a deployed model with a new and improved version. Let’s now take a look at a detailed example using the combination of KSQL and Python. 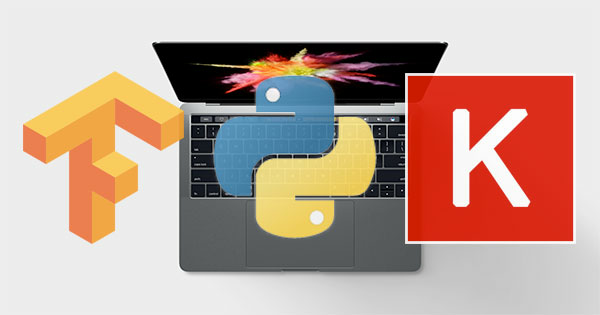 It involves advanced code examples using ksql-python and other widespread components from Python’s machine learning ecosystem, like NumPy, pandas, TensorFlow, and Keras. The use case is fraud detection for credit card payments. We use a test dataset from Kaggle as a foundation to train an unsupervised autoencoder to detect anomalies and potential fraud in payments. The focus of this example is not just model training, but the whole machine learning infrastructure, including data ingestion, data preprocessing, model training, model deployment, and monitoring. All of this needs to be scalable, reliable, and performant. For the full running example and more details, see the documentation. Let’s take a look at a few snippets of the Jupyter Notebook. As you can see, both in theory (Google’s paper Hidden Technical Debt in Machine Learning Systems) and in practice (Uber’s machine learning platform Michelangelo), it is not a simple task to build a scalable, reliable, and performant machine learning infrastructure. The impedance mismatch between data scientists, data engineers, and production engineers must be resolved in order for machine learning projects to deliver real business value. This requires using the right tool for the job and understanding how to combine them. You can use Python and Jupyter for prototyping and demos (often Kafka and KSQL might be overhead here and not needed if you just want to do fast, simple prototyping on a historical dataset) or combine Python and Jupyter with your whole development lifecycle up to production deployments at scale. Python for prototyping and Apache Kafka for a scalable streaming platform are not rival technology stacks. They work together very well, especially if you use “helper tools” like Jupyter Notebooks and KSQL. Please try it out and let us know your thoughts. 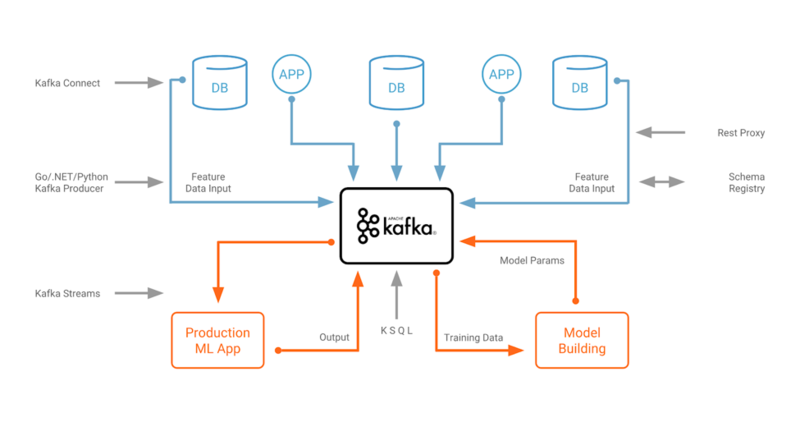 How do you leverage the Apache Kafka ecosystem in your machine learning projects?